The Sabarimala Karma Samithi leaders urged to end the harassment of its activists in the name of breach of law and order. Regarding this protest, the LDF and UDF have accused the Sabarimala Karma Samithi of violating the model code of conduct during Lok Sabha election. Thiruvananthapuram: The Sabarimala Karma Samithi launched an agitation in front of the secretariat in Thiruvananthapuram, Kerala, on Saturday. The Samithi leaders demanded an end to the harassment against its activists in the name of breach of law and order. Regarding this protest, the LDF and the UDF have accused the Sabarimala Karma Samithi of violating the model code of conduct with Lok Sabha election scheduled on April 23. When MyNation spoke to LDF leader EP Jayarajan regarding this issue, he said, "BJP is a national party, but still it stoops to such a low. Even though the Election Commission said not to use Sabarimala as a campaign issue, the Prime Minister to the BJP state president, all are using the issue again and again. Sabarimala has turned into an election product. We are also planning to complain against the state president for violating the model code of conduct." UDF leader Oommen Chandy also said to media that the BJP’s campaign to cash in on Sabarimala would not succeed. Activist Rahul Eswar said to MyNation, "Sabarimala Karma Samithi is an RSS organisation. RSS is a cultural organisation of the BJP and they have all the rights to speak about Sabarimala, and at the same time, the other parties also have the right to go against them. Samithi was the one organisation that stood with the devotees to protest against Sabarimala verdict of the Supreme Court." Ayyappa devotees have been staging protests since October last year with an intention to preserve the tradition in Sabarimala. With Lok Sabha election nearing, they have come up with a new strategy claiming that they will vote for only those leaders, who will preserve "their Sabarimala". The Ayyappa devotees also insist that in the election manifesto, it should be clearly written that the party favours and will protect the Sabarimala temple. The devotees openly posted posters on the walls outside their homes, indicating that they will only vote for the candidate, who will seek votes with the open promise of supporting Sabarimala and its tradition. This proves that the Ayyappa devotees are urging the candidates to take up the Sabarimala issue as the main agenda in their manifesto for the election. 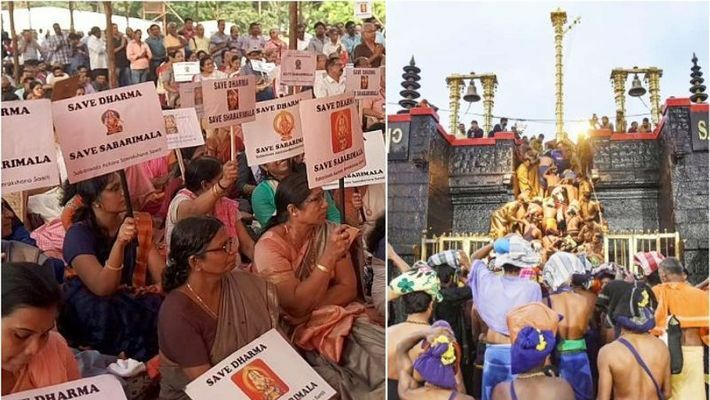 "I do not understand why Sabarimala issue should be violation of the model code of conduct because Sabarimala is one of the important issues of Kerala," said Reena Rameshan, an Ayyappa devotee from Kerala.